Inhaled cannabis reduces pain and improves sleep compared to placebo, and is well tolerated by patients with chronic neuropathy, according to clinical trial data published this week in the Journal of the Canadian Medical Association (CMAJ). Investigators at McGill University in Montreal assessed the efficacy of inhaled cannabis on pain intensity in 23 subjects with chronic post-traumatic or post-surgical neuropathic pain in a randomized, double-blind, placebo-controlled crossover trial. Participants in the study received a single inhalation of 25 mg of 9.4 percent herbal cannabis or placebo three times daily. All of the volunteers in the study suffered from refractory pain for which conventional therapies had proven ineffective. In February, investigators from the California Center for Medicinal Cannabis Research summarized the results of four separate FDA ‘gold standard’ designed clinical trials demonstrating that inhaled marijuana was safe and effective for the treatment of neuropathy. An estimated one to two percent of the population suffers from some form of neuropathic pain, which typically goes untreated by standard analgesics. Listen to NORML Executive Director Allen St. Pierre and NORML Advisory Board member Lester Grinspoon discuss this trial, and other subjects related to the medical use of cannabis, on NPR’s The Diane Rehm show here. Medical marijuana’s not getting any better – the time for RE-legalization is NOW! Author’s update: the graphics in the post below have been updated to correct some minor mistakes, such as dated information that left out Rhode Island and Maine’s dispensaries and Oregon’s recent acceptance of Alzheimer’s agitation as a qualifying condition. Also, I have outlined Oregon’s attempt at legalization through the OCTA petition as it could be reasonably said to be as far along or farther along than Washington’s I-1068. I regret my errors. With New Jersey recently becoming the 14th medical marijuana state, activists in marijuana law reform have been celebrating. After all, over 82 million Americans now live in states where medical use of marijuana is legal – that’s 27% of the US population! Last election, Massachusetts became the 13th decriminalization state, which means over 107 million Americans live in a state where possession of small personal amounts of marijuana no longer merit an arrest – that’s 35% of the US population. However, after watching fourteen years of marijuana activism focused solely on those who use cannabis for medicine, I must warn activists that medical marijuana is not getting any better and the time for re-legalization of cannabis for all adults – even the healthy ones – is now. Medical marijuana was a great 20th century strategy to get the sick and dying off the battlefield in the war on drugs. It was the perfect vehicle to enlighten the public, who for so long have been indoctrinated into the reefer madness that classifies cannabis like LSD and heroin. But in the 21st century the idea that marijuana is only a medicine is beginning to take hold and governments and voters are crafting ever-more-restrictive medical marijuana laws. For the vast majority of cannabis consumers this threatens to move us from the category of “illegal drug users” to “possessors of medicine without a prescription” – a step up, perhaps, but still left facing criminal prosecution. Patients are protected from arrest. If we consider these five attributes of the law the baseline, then in the past fourteen years, all thirteen medical marijuana states that have followed have failed to achieve all five. Eight states only offer three or four of those liberties and the rest offer two or only one. Most disturbingly, the right of patients to grow their own medicine (or have a caregiver do it for them), which has been a bedrock principle in medical marijuana law, was taken away from patients in the most recent medical marijuana state, New Jersey. Bills that were considered but vetoed in 2009 in Minnesota and New Hampshire, and those moving forward in New York, Pennsylvania, as well as an initiative in Arizona, all sacrifice this core right. A comparison of plant and possession limits also shows the decline from the original starting point in California, where 12 plants and 8 ounces are allowed. Oregon and Washington passed their laws next and have the highest statutory limits: 24 plants and 24 ounces in Oregon and 15 plants and 24 ounces in Washington. (To be fair, all the West Coast states started with lower limits or more vague limits that were modified by the legislature.) But since then, only one state has allowed more than 3 ounces (New Mexico with 6 ounces) and average number of plants allowed is a little less than ten. Another decline in medical marijuana freedom appears when we look at the conditions for which medical marijuana protection is afforded in the various states. There are eight conditions which could be considered the “standard” ones: cancer; HIV/AIDS; seizure disorders, like epilepsy; spastic disorders, like multiple sclerosis; glaucoma; chronic nausea; cachexia; and chronic pain. Most medical marijuana states recognize all eight conditions; a couple (Vermont and Rhode Island) recognize seven of eight. The latest law in New Jersey, however, eliminated chronic pain, chronic nausea, and cachexia, making it the most restrictive list in the nation. The bill proposed but vetoed in New Hampshire required one to try all other remedies for chronic pain before trying medical marijuana. The vetoed Minnesota bill wouldn’t even allow cancer and HIV/AIDS patients to use medical marijuana unless they could show they were terminal (about to die). The lists in the latest proposed bills continue to become more restricted. Until we do have legalization for all, every medical marijuana law is going to fail to adequately serve all medical users and subject them to increasing restriction and scrutiny. Additionally, medical marijuana laws make patients an attractive target for criminals because prohibition maintains huge profits for stolen medical cannabis, as well as becoming targets for overzealous anti-marijuana cops and prosecutors. The first time I met Madeline Martinez, the executive director of Oregon NORML, she told me about her dream…a meeting place for medical marijuana patients, some space to hold classes, a very different vision of healthcare. I took a drive to Portland last week to see this dream come true; to Oregon NORML’s World Famous-Cannabis Café, a trip to a Future of our own making. Set in an older blue-collar neighborhood in North East Portland, NORML’s Cannabis Café, occupies a building that was reputed to be a ‘speakeasy’ during Prohibition, alcohol Prohibition, that is. It includes a meeting/concert space upstairs for about 200+ people, in addition to the Café downstairs. Oregon NORML signed a lease this fall with the onsite restaurant operator and took over the business in November. NORML volunteers have been working there non-stop ever since, turning the building into the Cannabis Café. Its opening last month became a world-wide press event…apparently a lot more people than Madeline thought the NORML’s Cannabis Café was an idea whose time had come. America is currently a crazy-quilt of regulation with the 13 states and counting that have legal medical marijuana. Think what it will look like when all 50 states finally have it! In July, a front page article in the Wall Street Journal announced to the world that the Feds were standing down from enforcement in states with medical marijuana laws, and that MEDICAL MARIJUANA IS NOW OPEN FOR BUSINESS. As I read this, I could imagine entrepreneurs from coast to coast starting to draft their own plans for the medical marijuana businesses, the Next New Thing. 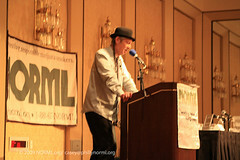 Stephen DeAngelo, the founder of Oakland’s Harborside Health Center, the Bay Area’s largest medical marijuana dispensary, gave one of the most thought provoking speeches at NORML’s 2009 Annual Conference on this very important topic: When marijuana is finally legalized (and new polls indicate America has finally reached the tipping point on this political issue) and the dust has settled, what will the business end of marijuana eventually come to look like? Remember, we are talking about taking an underground multi-billion dollar business and bringing it above ground. This is BIG. There will be huge long-term societal consequences of legalization far beyond the river of tax revenues it will create, many of which will be determined by what physical form legalization takes. So, what will the legal marijuana business in America come to look like? Something big and corporate? Something along the lines of Pepsi, RJ Reynolds, Starbucks, Pfizer, or Budweiser companies that market similar kinds of products??? Big profits, huge advertising budgets and lots of political cash….OR…should legal marijuana be something very different? Pain management is one of the places where the rubber truly meets the road in healthcare, a multi-billion dollar business. Non-toxic cannabinoid therapy has a very real place there. And non-toxic is good, as the very first rule of medicine should always be ‘to do no harm’. So, shouldn’t cannabis, from the get-go, do it differently than the Vicodin/Oxycodone ‘take these pills by yourself’ delivery model? After all, cannabis and all its users, medicinal or not, have been long defined by society as ‘counterculture’, so shouldn’t we be expected to do it differently, when we got our turn to create legal marijuana??? How about creating a non-profit medical cannabis delivery system whose central focus was on the patients, not profits for starters? Patients will have better results in chronic pain relief in the social setting of a Cannabis Café, where having people to talk to makes one’s problems feel lighter and one’s pain (medicated or not) easier to bear. Classes will be starting soon at the Cannabis Café on everything from aerobics, yoga, and weight management to plant propagation. Figuring out ways to provide free medicine to the indigent has been part of the design of the Oregon NORML’s Cannabis Café since its very inception. (Imagine that, the poor thought of first in the NORML model, not dead-last like in the standard corporate model.) Perhaps a “Buds on Wheels” program for shut-in medical marijuana patients, too…A hemp products emporium, you get it, a place for everything cannabis, and you, too. At NORML’s Cannabis Café, feel better…get better And then…What if… patients could meet at NORML Cannabis Cafés all over the country and the revenues generated driving a host of programs, in the area of healthcare and post drug war reparations, like freeing the thousands in jail today on pot charges? Think about it. Is that the kind of future you want? We can have it. About two years ago, to better understand medical marijuana from the patient’s viewpoint, I interviewed the first 45 people waiting to get into one of the bi-monthly Oregon NORML Medical Marijuana meetings. Virtually everyone I asked that morning willingly volunteered his or her medical history. I heard a long litany of construction, car, and motorcycle accidents, of broken bones, dislocated joints, failed surgeries, and cancer… people who made me wonder, “How in the world does this guy/gal sleep at night?” Then it would occur to me, “Oh yes, of course, the cannabis.” For them NORML’s Cannabis Café puts dealing with serious medical issues in social setting…and shows it can be fun, as well. No wonder it’s a raging success. NORML’s Cannabis Café is getting better by the day, as this new evolving healthcare paradigm kicks in. America can definitely learn something from the good folks who are blazing the Oregon Trail with medical marijuana; the future IS ours for the molding.